We invite you to explore India - the Land with infinite beauty ! Whether you soar high into Himalayas or peer under the ruins of the Ancient monuments dotting the landscape of India, you will cherish the experience long after your visit ! This India Travel Guide on Ganesh Chaturthi is free from any commercial interest! This site is dedicated to promote India - the vast subcontinent, its glorious past, magnificent landscape and its infinite variety. 'Ganapati Bappa Morya, Pudhachya Varshi Laukar ya' - O Ganapathi my Lord, come back soon next year. Year after year these verses are repeated with adoration and devotion by the multitudes worshiping Ganesha - the Elephant God. 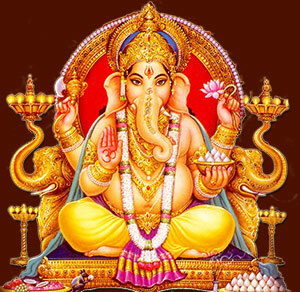 Lord Ganesha is the Lord of wisdom and power, prosperity and good fortune, harmony and peace and education. Lord Ganesha is believed to remove obstacles that come along the path of his devotees. He is popular as Vigneshwar, the lord who removes vigna or obstacles. It is a Hindu custom to invoke the blessings of Lord Ganesha before embarking on a new venture in life. Lord Ganesha is the elephant faced God; elephant head representing the symbol OM (the sound symbol of cosmic reality), the pranava manthra or the first manthra. Ganesha Chathurthi marks the birthday of Lord Ganesha; he being born on the 4th day of the fortnight. Ganesha Chathurthi is celebrated with much fervor in Maharashtra, Tamil Nadu, Karnataka, Goa, Rajasthan, and Andhra Pradesh. It is celebrated during the month of Bhaadrapada; the festival celebrations begin on shukla chathurthi and end on Anant Chaturdashi. The festival is celebrated for 10 days. In Tamilnadu, the birthday of Lord Ganesha is celebrated on the 4th day of shuklapaksha (new moon to full moon) during the Tamil month of Aavani (August-September). What began as private celebrations at home turned into a public celebration when Lokmanya Tilak popularized such gatherings to build unity and awareness about the freedom struggle among the masses. Cultural performances like dance dramas, musical concerts, poetry recitations, and debates were held during the festival. Since then, the tradition of community celebration of Ganesh Chaturthi continues in Maharashtra. Mumbai sees probably some of the largest and well attended celebration gatherings. Goddess Parvathi decided to create a bodyguard to guard the entrance of her place while she went for her bath. She created a young boy from the turmeric paste from her body and bestowed life into him. She set him on guard while she bathed. Lord Shiva who came in then was denied entry by the little boy. Enraged Shiva severed the little boy's head, this upset Goddess Parvathi. As an effort to console Parvathi, Shiva sent his gana to bring the head of a living being they encounter first facing north. The first head they saw was of a baby elephant and thus Lord Ganesha got his elephant head. Lord Shiva fixed the head on the trunk of the boy and breathed in life. The little boy got his name Ganapathi. Lord Shiva adopted him as his elder son and made Ganesha the chief of his army. Lord Shiva declared that Ganesha needs to be worshipped first before embarking on any religious activities. Elephant head: Great strength representing 'tat'. Human form: Symbol of wisdom and intelligence representing 'tvam'. Broken tusk: Sacrifice, he sacrifices his tusk to write 'The Mahabharata'. Celebrating Ganesha chathurthi gently reminds us of the fact that though we worship the Lord in his manifested form, yet there is a formless divine. The idol that is venerated is the manifested form and post immersion the devotion we carry is the divine feeling. Ganesha chathurthi is celebrated by bringing home the clay image/of Lord Ganesha. Auspicious music is played while taking the idol home; the idol is welcomed by performing arthi at the entrance of the house. A mantap is made at home and is well-decorated with flowers, lights, garlands, etc. Lord Ganesha is placed in the mandap and puja is performed. Ganesh puja celebrations can be held for 1, 3, 7 or 10 days. Puja is done everyday in the morning and evening until the idol is at home. Depending on the number of days of puja, the visarjan is done. This involves immersing the idol in the sea, river or lake. Women folk belonging to Maharashtra, Karnataka and Andhra Pradesh celebrate Gowri puja. They pay their respects to the mother of Lord Ganesha. This puja is celebrated the previous day of Ganesha Chathurthi. Ganesh idols are immersed in water bodies and the seas to symbolize the eternal cycle of creation and destruction. Plaster of Paris idols were used for years as it offered a strong and cheap medium. But over the years, environmental pollution has been on the rise and the need is being felt to incorporate eco-friendly materials for the Ganesh idols. Usage of chemical paints is also frowned upon. Instead, idols can be made with clay, paper mache or locally found materials. Use paints that are lead and arsenic free. Traditionally used in Bengal, Shola pith or Indian cork is another material that is used to craft eco-friendly Ganesh idols. Its luster, malleability and texture lend easily to elaborate idols. Modak is a sweet dumpling made with rice flour; the stuffing is made from coconut and jaggery. It is said to be a favorite with the Elephant God. Different regions have their own specialties to offer as naivedyam to Lord Ganesha. For the outer covering, mix salt, flour and ghee. Gradually add water and knead to form firm dough. Cover with wet cloth and set aside. For the stuffing, take sugar, milk and coconut in a pan and cook on gentle heat. Add cardamom powder and chopped cashews and raisins. Divide the dough into about 20 balls, so that you can roll them out like small chapattis. Place a spoonful of stuffing in the center and fold each in half. You can use a mould too to get attractive shapes. Deep fry the karanjis for about 2 minutes in hot oil till golden brown. Boil sugar and water. When the mixture is ready, add milk and boil for a few minutes as the dirt will form on the top. Strain this and continue to boil till it is sticky. Add cardamom powder and food color. For Boondi: Mix flour and milk to a smooth batter. Heat ghee in a heavy frying pan. Gently pour a bit of batter over the strainer held over the hot ghee. This will form small boondis in the ghee. Fry and remove gently. Repeat with all the batter. Immerse boondi in syrup; ensuring that the boondis are not swimming in excess syrup. Spread this mix on a large plate and sprinkle a little hot water over it. Keep it covered for about 10 minutes. Shape the mixture into laddus. Heat 2 tsp of ghee and roast rava over a low flame till fragrant. Grind rava to a coarse powder. Mix with the powdered sugar and cardamom powder. Add the cashews and raisins. /Heat the remaining ghee. Add in small measures to the mix and make small balls. This is a bit tricky as the mixture is hot to the touch because of adding ghee. India Tourism - Explore 3.2 million sq. km of India. Medical Tourism in India - Affordable health care in India. Dental Tourism India - Affordable Dental care in India. Travelling in India - Guide for your travel. Indian Recipe Chinese Style - Mouthwatering recipes and more. Traditional Indian Weddings - Significance of the Traditional Indian Weddings. Indian Bridal Jewelry - Significance of Bridal Jewelry in India. Indian Dance - Significance of Dance in India. Indian Spices - Boost your Health. Touring India in Royal Enfield Bullet - Thrills and Chills with Bullet. Royal Enfield Bullet - Facts and Figures of Royal Enfield Bullet. Diwali Greetings - Let your diwali hot up. Diwali Shopping - celebrated with much pomp and enthusiasm. Diwali Festival of Light - Diwali as Sound & light show. Rangoli - Rangoli patterns intricate design. White Water Rafting India - Heart pounding adventure in water. Sea Fish in India - Fish from Indian Coast. Indian Sea Fish - Fish from Indian Coast.